​We are currently recruiting for our upcoming 2019 season. After some very strong performances over the last few years, including three playoffs runs, which ended at the provincial finals in 2015 and 2018, and the provincial semi-finals in 2016, our ladies are going cup hunting this year. Our 2019 Senior Women’s team is looking for women over the age of 18 who would be interested in playing with us this season. No prior rugby experience is required, and in rugby 15’s, which makes up the bulk of our season, we need players of all shapes, sizes, and talents. During the summer, we practice twice a week, and play on Saturdays. Our practices are Tuesday and Thursday evenings from 7-8:30 in Beaconsfield and games are held during the daytime on Saturday. During the off-season, we also have plenty of activities to help our teammates get into better shape, and get more comfortable going into the rugby season, such as fitness training, and indoor touch rugby. 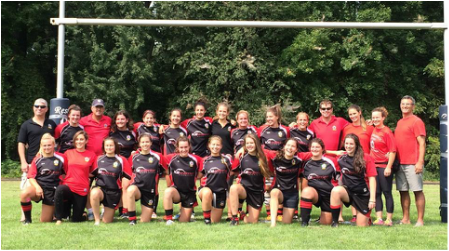 If you would be interested in coming out and giving BRFC, and rugby, a “try,” please send a note to Emma Gallagher, our Senior Women’s Director. Emma will be pleased to answer any questions you may have about the upcoming season.